Mauricio of Gal Editora sent this photo from a recent convention over there... Fastest Man gets a great position on the poster :o) Mauricio is pleased with how it's selling, which is great news. 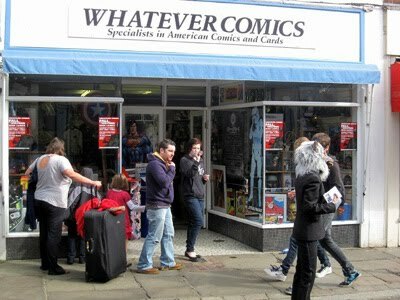 ... was the last thing I said to Andy as we stepped out of the car to meet Manny of Whatever Comics in Canterbury. Manny has been a great supporter of Accent UK for a few years now, selling more copies of our books than any other store, anywhere. 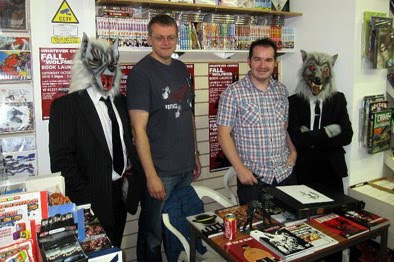 We had decided to launch Fall Of The Wolfmen at Manny's store mainly because it would give us the opportunity to meet him and thank him in person for being so helpful and encouraging ever since The Wolfmen first hit the shelves. To be honest I've been to enough store signings to know how they can go, and so my expectations were set very low. I was completely blown away, however, by the response we got. I knew Manny had pushed our books on a number of his customers, maybe even most of them, but to a man they all told me that he had been right to do so. They had enjoyed them so much. We met a lot of really committed comic fans and had a good chat with a lot of very interesting and interested people. It was a really really great day. We were working the table from 1pm to 5pm. Not a moment passed when we weren't doing something, and the time just flew. I can't imagine better hosts than Manny and Debe, as they took us under their wings and sorted everything out for us. Also the work done, as a favour for a friend, by Karol (and later Carl) in walking the streets in Wolfmen garb to raise the profile of the event worked incredibly well, so a big thank you to them as well. I've written a fuller report over on the Accentukcomics website, with a lot more photos. 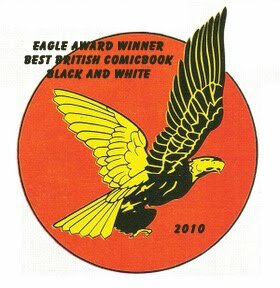 Also pop over to the http://www.whatevercomics.com/ to find out more about the store, and take part in the very active forum, and visit Andy Bloor's blog (follow the link on the right).